08-Feb-2004 -- My mother, my sister and my brother-in-law had followed us to Cachoeira do Sul to visit this confluence. From Mr. Valmir's backyard we saw the point over a big rice plantation and the GPS indicated 400 meters. We started the approach walking between the rice pads and preparing the spirit to step on the water. Surprisingly, after walking in zig-zag, no wetting were necessary to get the zeroes. After the visit we head for Porto Alegre and our companions had come back home. 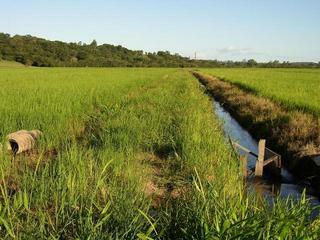 Cachoeira do Sul is a great rice producer and it is also distinguished in cattle creation. Thanks to Mr. Valmir for leading us to the point. #1: General view of the confluence. #7: General view from Mr. Valmir's backyard.